Showing results for tags 'K1R'. ~~~~~~~~~~~~~~~~~~~~~~~~~~~~~~~~~~~~~~~~~~ » KotOR 1 Restoration 1.2 Read-Me ~~~~~~~~~~~~~~~~~~~~~~~~~~~~~~~~~~~~~~~~~~ NAME: KotOR 1 Restoration 1.2 TYPE: Restoration VERSION: 1.2 SIZE - Unzipped: 145 Megabytes, Zipped: 47.2 Megabytes DATE RELEASED: May 31, 2016 KOTOR 1 RESTORATION FORUMS: http://deadlystream.com/forum/forum/31-kotor1-restoration-k1r/ ~~~~~~~~~~~~~~~~~~~~~~~~~~~~~~~~~~~~~~~~~~ » DESCRIPTION ~~~~~~~~~~~~~~~~~~~~~~~~~~~~~~~~~~~~~~~~~~ WARNING: IN ALMOST ALL CASES, IT IS RECOMMENDED TO INSTALL THE K1R RESTORATION BEFORE ANY OTHER MODS!!! THE ONLY EXCEPTION SO FAR IS KAINZORUS PRIME'S NPC OVERHAUL... The KotOR 1 Restoration Mod is an attempt to restore almost all the content that was cut from the game Star Wars: Knights of the Old Republic by BioWare Corp. Of course, these restorations will be within reason and things that were cut because they did not fit with the plot, and cannot be made to fit with the plot, will most definitley NOT be restored. ~~~~~~~~~~~~~~~~~~~~~~~~~~~~~~~~~~~~~~~~~~ » INTEGRATED MODS ~~~~~~~~~~~~~~~~~~~~~~~~~~~~~~~~~~~~~~~~~~ ~~~~~~~~~~~~~~~~~~~~~~~~~~~~~~~~~~~~~~~~~~ » RESTORED CONTENT ~~~~~~~~~~~~~~~~~~~~~~~~~~~~~~~~~~~~~~~~~~ ~~~~~~~~~~~~~~~~~~~~~~~~~~~~~~~~~~~~~~~~~~ » BUG FIXES/CHANGE LOG FOR 1.2 ~~~~~~~~~~~~~~~~~~~~~~~~~~~~~~~~~~~~~~~~~~ »» Original game: »» K1R Bugs: ~~~~~~~~~~~~~~~~~~~~~~~~~~~~~~~~~~~~~~~~~~ » BUG FIXES/CHANGE LOG FOR 1.1 ~~~~~~~~~~~~~~~~~~~~~~~~~~~~~~~~~~~~~~~~~~ There weren't too many bugs in KotOR 1, thus there is such a short list. ~~~~~~~~~~~~~~~~~~~~~~~~~~~~~~~~~~~~~~~~~~ » INSTALLATION ~~~~~~~~~~~~~~~~~~~~~~~~~~~~~~~~~~~~~~~~~~ An installation which involves the TSL Patcher has been made ready for your use and is the simplest and easiest way to carry out installation. Alternatively, a secondary installer has been made for convenience. It will not patch the files like the TSL Patcher will, but it should be less of a headache for most users. HOWEVER, IT WILL NEED TO BE INSTALLED BEFORE ANY OTHER MODS!!! Note: The K1R team is not responsible for any incompatibility issues that may arise from the use of this mod in conjunction with other mods. 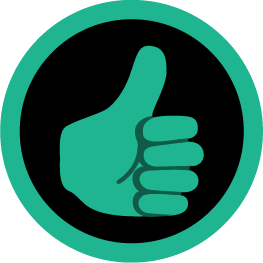 Also, in order to provide the best feedback for us we recommend that you play K1R with NO other mods installed. Note 2: If using the TSL Patcher AND your game is in English, before installing, copy the dialog.tlk file bundled with this package into the KotOR directory. This will give you the grammar and typo fixes to the vanilla text. ~~~~~~~~~~~~~~~~~~~~~~~~~~~~~~~~~~~~~~~~~~ »»»» TSL PATCHER INSTALLATION ~~~~~~~~~~~~~~~~~~~~~~~~~~~~~~~~~~~~~~~~~~ 1) Double click K1R_1.2_Installer.exe found in the main directory of the unpacked folder. 2) Click the button labeled Install Mod. 3) Click yes to the box that'll pop up... if you wish to proceed with installation. 4) Watch as all the little file names and progress reports scroll by and wait until the installer is complete. ~~~~~~~~~~~~~~~~~~~~~~~~~~~~~~~~~~~~~~~~~~ » BUG REPORTING ~~~~~~~~~~~~~~~~~~~~~~~~~~~~~~~~~~~~~~~~~~ There are 2 ways to report bugs: 1: Post your issues in the Bug Reporting Thread. 2: PM your issues to Fair Strides at Deadlystream. 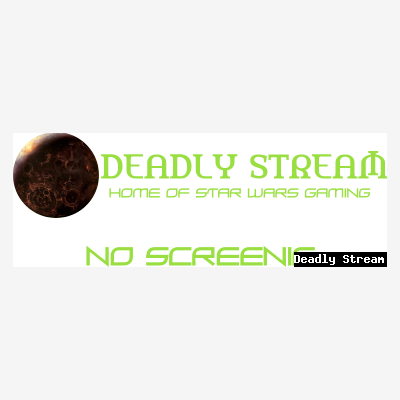 TO REPORT THROUGH PM 1) Go to DeadlyStream (http://deadlystream.com/) and search for the user Fair Strides ( http://deadlystream.com/forum/user/9107-fair-strides/ ) 2) Send a private message with as much detail as possible of what is occurring in your game. He will likely report back to you within a week. TO REPORT THROUGH THE BUG THREAD: 1) Go to the Bug Thread ( http://deadlystream.com/forum/topic/4457-k1r-12-impressions-and-bug-reports-read-me-first/ ) 2) Reply quoting and answering all of the questions as they apply to your issue. ~~~~~~~~~~~~~~~~~~~~~~~~~~~~~~~~~~~~~~~~~~ » VOICE ACTOR ~~~~~~~~~~~~~~~~~~~~~~~~~~~~~~~~~~~~~~~~~~ Pazaak Tournament Mandalorians...Zhaboka Filters for Zaerdra's lines......Zhaboka Filters for sea floor lines......Zhaboka Thanks Zhaboka. You really brought life to the characters, and those parts would be pretty lame without you. ~~~~~~~~~~~~~~~~~~~~~~~~~~~~~~~~~~~~~~~~~~ » CONTRIBUTORS ~~~~~~~~~~~~~~~~~~~~~~~~~~~~~~~~~~~~~~~~~~ A BIG thanks to all of you! ~~~~~~~~~~~~~~~~~~~~~~~~~~~~~~~~~~~~~~ » TEAM MEMBERS ~~~~~~~~~~~~~~~~~~~~~~~~~~~~~~~~~~~~~~ - ZM90, Team Leader - Mandalore, Team Member - Jatku, Team Member - Fallen Guardian, Team Member - LDR, Team Member - Fair Strides, Team Member and main producer of the 1.1 update (and 1.2 update) - Malkior, Beta Tester - LiliArch, Beta Tester (though, putting them on a test is more like setting off a permacrete detonator in an apartment... ) - GrandmasterArcturus, 1.2 Beta-tester and LPer ~~~~~~~~~~~~~~~~~~~~~~~~~~~~~~~~~~~~~~ » SPECIAL THANKS ~~~~~~~~~~~~~~~~~~~~~~~~~~~~~~~~~~~~~~ To the tool creators of the community ~ Kotor Tool.....................A VERY special thanks to Fred Tetra ~ K-GFF GFF Editor/DLGEditor.....tk102 ~ Lipsynch Editor................JDNoa ~ DeNCS Script Decompiler........JDNoa ~ AniCAM.........................JDNoa ~ ERF Editor/TSLPatcher..........stoffe (and later Fair Strides) And a shoutout for SithRevan (RIP) for beginning the restoration crusade for KotOR 1. ~~~~~~~~~~~~~~~~~~~~~~~~~~~~~~~~~~~~~~ » REDISTRIBUTION ~~~~~~~~~~~~~~~~~~~~~~~~~~~~~~~~~~~~~~ The K1R 1.2 OFFICIAL may NOT be redistributed in any way without the explicit permission of the K1R team and the proper credit given. 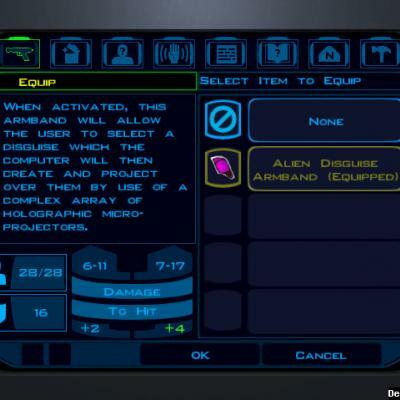 ~~~~~~~~~~~~~~~~~~~~~~~~~~~~~~~~~~~~~~ » LEGAL ~~~~~~~~~~~~~~~~~~~~~~~~~~~~~~~~~~~~~~ THIS MODIFICATION IS PROVIDED AS-IS AND IS NOT SUPPORTED BY BIOWARE CORP/OBSIDIAN ENTERTAINMENT OR LUCASARTS OR ANY LICENSERS/SPONSORS OF THE AFOREMENTIONED COMPANIES. USE OF THIS FILE IS AT YOUR OWN RISK AND THE AFOREMENTIONED COMPANIES OR THE AUTHORS ARE NOT RESPONSIBLE FOR ANY DAMAGE CAUSED TO YOUR COMPUTER FOR THE USAGE OF THIS FILE. A Mod for Star Wars Knights of The Old Republic Author: N-DReW25 Release Date: 07.03.2017 Installation: Simply copy and paste the files within the "For override" folder into your Star Wars Knights of The Old Republic override folder. If you have K1R installed make sure you overwrite the files already within the override as the files in this mod are edited from K1R's "kor39_utharwynn.dlg" Uninstallation: Take them out again Description: Did you know at some point during development Bioware planned for your party members to come with you into Naga Sadow's tomb? As you may know that didn't make it into the final game but hidden in the game files are voice overs for each party member for when they talk about the Korriban Star Map similar as to what they do on the other worlds. 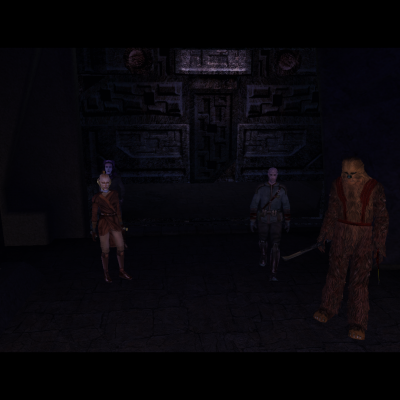 When K1R came along they decided not to include it in as not having them appear in game makes a lot of sense, this mod allows for your party members to enter the tomb and help you fight off the Terentateks, Uthar and Yuthura and say those cut lines when you open the Star Map WARNING: This is best used with K1R as it modifies an Uthar dialogue from that mod and I have no clue what K1R actually did to that dialogue so using this Mod in the normal game may cause crashes Known Bugs: When your main character and Uthar run to the exit when you leave the academy your party members might not move at all. When you enter a certain room inside the tomb it is possible to have your party members locked out, this isn't a problem as those doors should all open up again Your party members may spawn in a location that blocks your PC and/or Uthar and Yuthura when you enter the module Your party members will not say there restored lines if they are not with you in the star map room These four bugs aren't game breaking just weird, Please report any more bugs that may occur Incompatibilities: Will be incompatible with "kor39_utharwynn.dlg" and "kor35_utharwynn.dlg" but the mod is 100% compatible with K1R Permissions: Do NOT claim credit for this mod and do not use assets from this mod without my permission Thanks: Fair Strides for making the what's restored in K1R list The entire K1R team for making K1R Bioware for such an amazing game Fred Tetra for Kotor Tool and everyone who downloads the mod. Legal: THIS MODIFICATION IS NOT SUPPORTED BY BIOWARE/OBSIDIAN ENTERTAINMENT, LUCASARTS, DISNEY OR ANY LICENSERS/SPONSORS OF THE MENTIONED COMPANIES. USE OF THIS FILE IS AT YOUR OWN RISK AND THE ABOVE MENTIONED COMPANIES OR THE AUTHOR IS NOT RESPONSIBLE FOR ANY DAMAGE CAUSED TO YOUR COMPUTER FOR THE USAGE OF THIS FILE. A Mod for Star Wars Knights of The Old Republic Author: N-DReW25 Release Date: 28.08.2016 1.1 Release Date: 06.03.2017 Installation: simply click on the TSLPatcher.exe and click install and sit back and watch the TSLatcher do its magic Uninstallation: Delete "g_w_waraxe001.uti" from the override folder and replace the baseitems.2da file within the override folder with the one generated within the Backups folder Description: In Kotor 1 there is a Cut Item called the Gamorrean Battleaxe. it isn't the best weapon in the game through in my opinion it is definitely a cool looking weapon. In the K1R mod you can obtain it in the Restored Black Vulkar Level though when you do find it you'll soon realize that it is restricted to a single hand meaning you can't duel wield it properly, this mod will fix that. 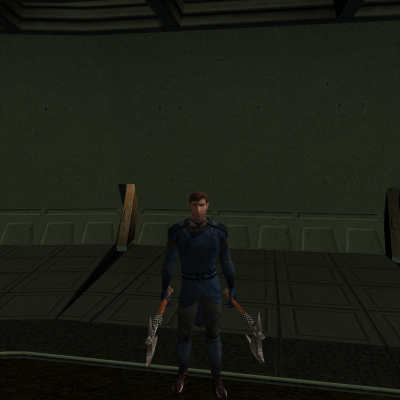 What the mod does is allow you to dual wield the Gamorrean Battleaxe with another melee weapon. Note: This mod should be played with K1R as in the normal game you can't legitimately obtain the axe unless you either cheat or find a mod that adds the axe in Also, try out the Gamorrean Battleaxe Icon Fix 1.1 by djh269-http://deadlystream.com/forum/files/file/1038-gamorrean-battleaxe-icon-fix/ Known Bugs: this mod shouldn't have bugs but if there is Just PM me on Deadlystream. Incompatibilities: The TSLPatcher should now make most mods compatible with this one. Permissions: Do NOT claim credit for this mod! 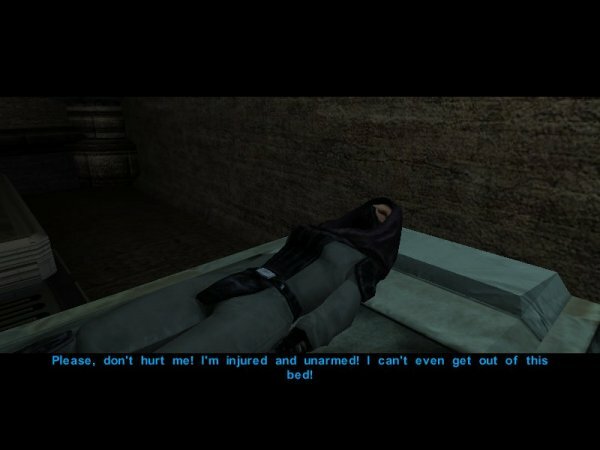 And ask me for Permission if you want to use this mod in your own mod Thanks: Bioware for such an amazing game, Fred Tetra for Kotor Tool and everyone who downloads the mod. djh269 for helping me out with the TSLPatcher Legal: THIS MODIFICATION IS NOT SUPPORTED BY BIOWARE/OBSIDIAN ENTERTAINMENT, LUCASARTS, DISNEY OR ANY LICENSERS/SPONSORS OF THE MENTIONED COMPANIES. USE OF THIS FILE IS AT YOUR OWN RISK AND THE ABOVE MENTIONED COMPANIES OR THE AUTHOR IS NOT RESPONSIBLE FOR ANY DAMAGE CAUSED TO YOUR COMPUTER FOR THE USAGE OF THIS FILE. Bastila on Korriban - K1R Version By Fair Strides Description: This is an old favorite of many players, and now we've simply made a K1R version that "meshes" better with the game. Though I honestly don't see a difference that broke the old mod with K1R, I did think it could be done in a way that wasn't as jarring. 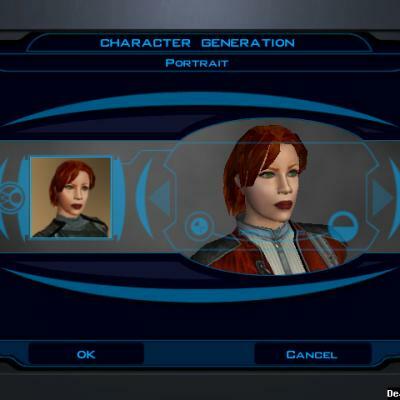 In the old version, Bastila was selectable despite saying that she wouldn't be going. In this version, you can choose to have her available or not. There are only two new player lines and no voice-less Bastila lines. Installation: Simply run the TSLPatcher and direct it to your KotOR 1 folder. Uninstallation: Delete the following files from your Override folder: k_sup_galaxymap.ncs fs_bast_disable.ncs ebo_bast_vision.dlg And replace the dialog.tlk file in your main KotOR folder with the dialog.tlk file in the backup folder made by the TSLPatcher. Has anyone on Deadlystream beaten the entire K1R without cheats on Impossible difficulty? If so, what mods did you have? I had thought several people had done this already, but ZM90 said, "I wonder if anybody has beaten Impossible Difficulty? I can tell you I am the one responsible for Impossible Difficulty and even I haven't beaten K1 on it." He also said, "I'll personally congratulate the first person that players through K1 on Impossible Difficulty only with no cheats and successfully beats the game." Which leaves me perplexed that it has not been done yet. Just wanted to let everyone know that I have one last mod to integrate (Kainzorus Prime's Manaan and Korriban Music Fixes) and then... I CAN MAKE THE INSTALLER(S)!!! 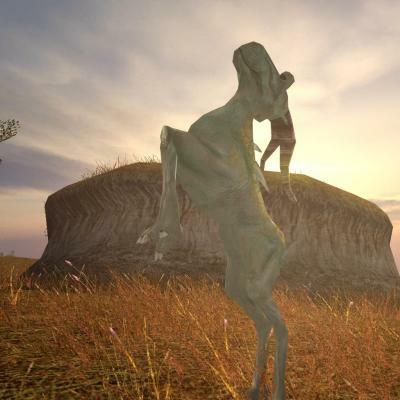 I will be making two installers this time: a TSL Patcher installer for compatibility concerns, and a TSLRCM-esque installer for convenience concerns. The TSLRCM-esque installer will be the recommended installer, but that will also just replace all of your files, so it's to be installed first and foremost in your mod builds. I'm using a lot of mods, I didn't keep a record of them but they could be like 60 or 75% of the mods here on DeadlyStream for K1, plus some other mods. I was wondering where can I find a crash log (to troubleshoot it on my own) or if anyone else has encountered this same problem or crash. As it says in the title it crashes at the student scene when entering Korriban for the first time. (The one in which the sith master was shouting at some students, if I remember correctly). I would appreciate if someone helped me with this, because I don't want to lose my savegames. Thanks. "K1R: The Fact She Has to Lay on the Bed Didn't Stop Us." :) Well, here's a little teaser for all of you wanting K1R 1.0! Released with permission from ZM90, I present to you a little piece of cut content that was said to be "unrestorable"... This is the Injured Sith Apprentice cut content that was discovered and partially reconstructed by Darth Insidious, and through a long hassle with modelling and animations, is finally implemented into the game! What's your verdict, people?